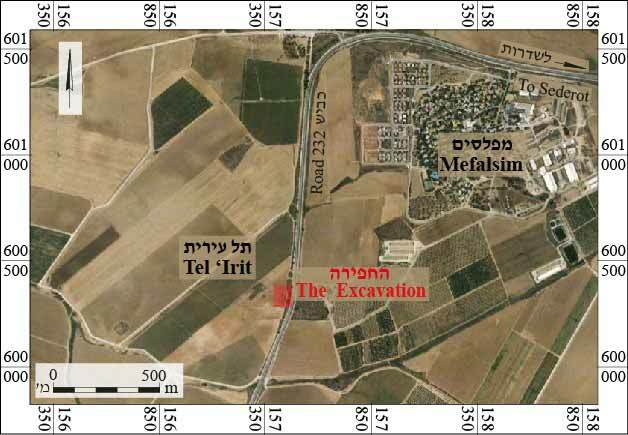 In February 2017, a salvage excavation was conducted at Tel ʽIrit, southwest of nearby Kibbutz Mefalsim (Permit No. A-7925; map ref. 157590-486/600622-379; Fig. 1), prior to infrastructure work. The excavation, undertaken on behalf of the Israel Antiquities Authority and financed by the Bezeq Company, was directed by D. Eisenberg-Degen (drafting), with the assistance of Y. Al-ʽAmor (administration), I. Lidsky-Reznikov (pottery drawing) and C. Amit (studio photography). Tel ʽIrit is one of six low mounds of pottery workshop debris extending over a small geographic area (c. 0.5 sq km) near Kibbutz Mefalsim. Their size and shape differ from mound to mound. Tel ʽIrit stands c. 15 m above its surroundings and is the highest of the six. A single excavation square was manually excavated on the southern slope of the tell (Fig. 2); the square’s northern section (depth c. 2.5 m) was documented. No architectural remains were discovered. Alternating layers of soil and pottery sherds (Figs. 3, 4) were documented in the section. The sherds found in the excavation date activity at the site to the late Byzantine period (end of sixth–beginning of seventh centuries CE). The section was covered upon completion of the excavation, the first excavation to be conducted at Tel ʽIrit and near Mefalsim in general. Five of the six mounds were documented in the survey of pottery workshops conducted in the Western Negev: sites consisting of large heaps of kiln debris belonging to a large pottery production center (Israel 1995). Based on the size of the mounds, Seriy (2015:38) asserted that some twenty kilns operated in the area simultaneously. 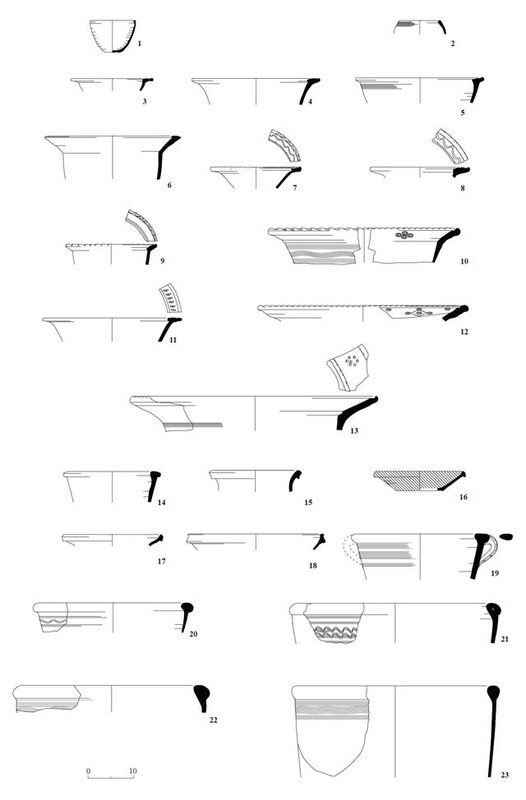 Eight strata, some comprised of soil (L102, L105, L107) and others of pottery sherds (L100, L103, L104, L106, L108), alternating one above the other, were documented in the section at Tel ʽIrit. 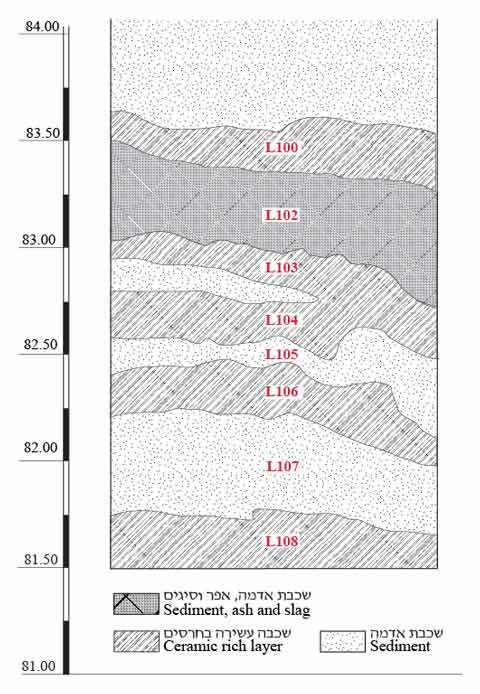 This accumulation of overlying layers indicates the intentional and planned deposition of the layers. The layers sloped to the south, thereby indicating that the central point whence the layers descended was north of the section. The layers differed in thickness and composition. The highest density of pottery sherds was in Stratum 100, containing 190 Gaza Ware jar handles, as opposed to 56 such handles found in Stratum 106 and 25 in Stratum 104. 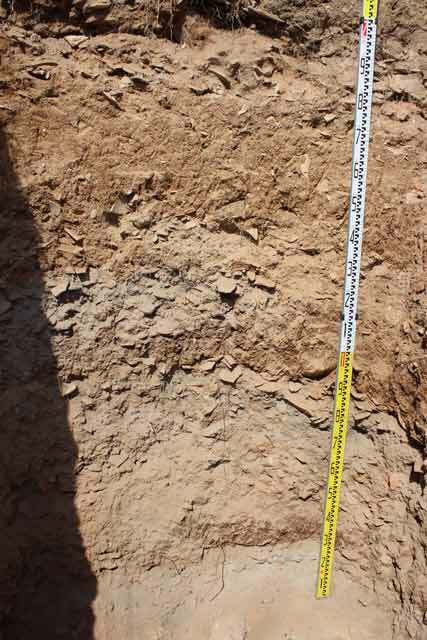 Stratum 102 consisted of soil mixed with ash and many slags. Several mudbrick fragments were found among the sherds in Stratum 104. The sherds discovered in the strata were relatively large and were not abraded. A single piece of metal and a jaw fragment of a sheep or goat were also found in the section. The size of the sherds, the absence of any wear on them and the paucity of other finds all indicate that the strata are a result of primary deposition on the tell. It seems that the layers were composed of debris originating in pottery kilns that operated nearby. 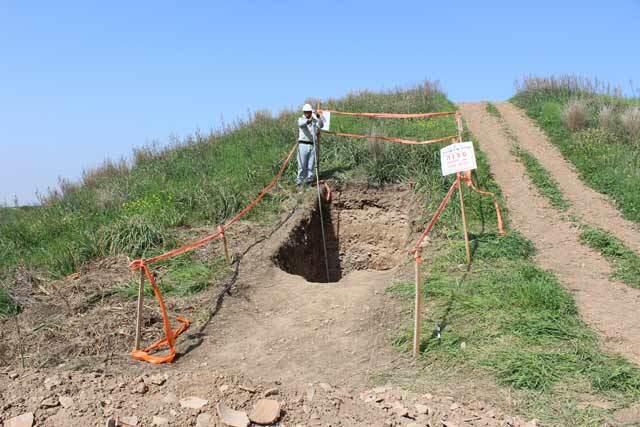 Upon completion of the manual excavation of the section, it was deepened (0.6 m) by means of a backhoe, revealing soil devoid of finds beneath Stratum 108. No additional layers of soil or pottery sherds were discovered. The Finds. 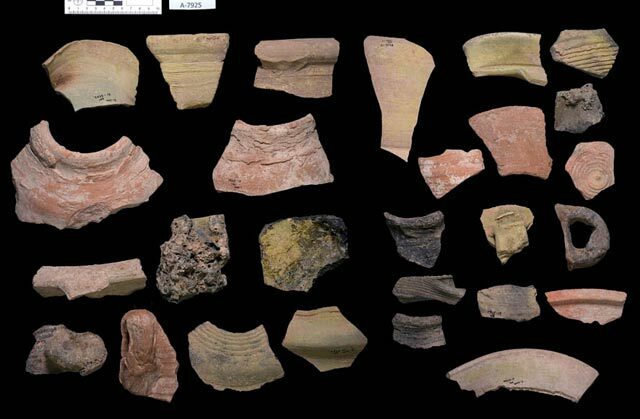 The layers of sherds discovered in the section included mainly the debris of a local pottery workshop—fragments of wasters and vessels that had been fired at a low temperature (Fig. 5), dating to the end of the Byzantine period. The ceramic assemblage includes plain bowls (Fig. 6:1, 2), one similar to the base of a Gaza Ware jar (Fig. 6:1); numerous fragments of deep bowls made of light colored, almost pale yellow clay, with an everted rim folded inward (Fig. 6:3–13)—some decorated with thumb indentations (Fig. 6:7–12) and some with stamped impressions (Fig. 6:10–13)—such as are found at many sites along the coastal plain and in the northern Negev (Nahshoni 1997:92), but the production site of the pottery workshop has not yet been discovered and they may have been manufactured in a workshop near Mefalsim; deep bowls with a short horizontal rim or an elongated triangular rim (Fig. 6:14, 15); a variety of kraters adorned on the upper part of their wall with wavy and combed decorations (Fig. 6:19–23); cooking utensils, including lids (Fig. 7:1–3), casseroles (Fig. 7:4, 5), fry pans (Fig. 7:6, 7), cooking pots (Fig. 7:8–10) and cooking jugs (Fig. 7:11, 12), some with a pinched rim (Fig. 7:12); Type 3 (Fig. 7:13–15) and Type 4 Gaza Ware jars (Fig. 7:16, 17; Majcherek 1995); a base of a goblet (Fig. 7:19); and juglets made of cooking-ware fabric (Fig. 7:20, 21). Other finds included vessels that were probably not produced at the site such as several imported serving bowls (Fig. 6:16–18), a bag-shaped jar (Fig. 7:18) and slipper-shaped oil lamps (Fig. 7:22–24). The assemblage from the excavation also included special ceramic artifacts such as a thick hollow clay wheel (Fig. 7:25) that may have been a rattle (Seriy 2015:63) and a spinning top or a wheel of a toy chariot connected to one or more horses. Clay horses used as toys were discovered nearby in the past (Rahmani 1981; and two items that were given to the State Treasures—Nos. 1947-408 and 2016-49). Most of the toy chariot wheels found previously are flat, without volume. Wheels similar to the one found at Tel ʽIrit were discovered in an excavation near Highway 3 (to be published in the final report of Eisenberg-Degen 2016) and in an excavation at Givʽat Aton (Seriy 2015:61). Another special find is a fragment of a clay toy horse, decorated with small stamped circles (Fig. 7:26), with a cylindrical hole in it. This is a fragment of the lower part of the horse, to which the wheels of the chariot were attached. Similar clay horses adorned with a decoration of stamped circles were found in a survey conducted in the area of ​​Mifalsim (Rahmani 1981; Seriy 2015:46). A lump of clay with several holes in it (Fig. 7:27) was also discovered, apparently used by a potter or possibly by a child as a toy. Judging by the numerous fragments of Gaza Ware jars discovered in the excavation, it seems that these were the main vessels that were produced in the pottery workshop next to the tell. The two types of Gaza Ware jars discovered in Tel ʽIrit date from the mid-fifth century to the seventh century CE. The Type 4 jar is somewhat later than the Type III jar, and it continues to occur until the second half of the seventh century CE. Both types were discovered in the same strata, and thus, may have been produced at the same time. However, it is also conceivable that the kiln and the workshop were not cleaned after every firing and that the debris on the tell does not represent the chronological activity of a pottery workshop. The Gaza Ware jars are made of clay rich in loess that comes from the southern coastal plain. In the past, it was assumed that the clay was brought from Gaza; hence, the name of the jars. Apparently, Gaza Ware jars were manufactured in many workshops such as those discovered in recent years on the southern coastal plain, including the ones in the Shimshon neighborhood of Ashqelon (Feder and Erickson-Gini 2012), the Third Mile Estate in Ashqelon (Israel and Erickson-Gini 2013), Khirbat Baraqa in Gan Yavne (Gadot and Tepper 2003), Yavne (Segal 2011), Khirbat el-Hannuna (Peretz 2008), Nirʽam Junction (Seriy 2010), Tel Ashdod (Baumgarten 2000) and Givʽati Junction (Baumgarten 2001, see the complete list of kilns cited therein). Five additional pottery workshops were documented along Nahal Besor and Nahal Shiqma during a survey conducted in 1991 (Israel 1993). Sites were also discovered, for example at Tel ʽIrit, where there was workshop debris but no traces of a kiln. If these sites are added to the workshops discovered on the southern coastal plain, then the number of pottery workshops on the southern coastal plain is significantly higher. Gaza Ware jars were mainly used for storing wine and other foodstuffs. Many pottery workshops were constructed next to winepresses and sometimes, alongside olive presses (Hadad 2009). The elongated form of these jars was suitable for maritime storage and transport. They were discovered at several places throughout Europe (Tomber and Williams 1986; McCormick 2001:37; Opris and Raţiu 2016), indicating extensive trade relations with the Land of Israel in the late Byzantine period. A built storeroom containing more than 70 Gaza Ware jars was discovered some 50 m from the beach at a site south of Ashqelon and c. 10 km northwest of Mefalsim (Fabian and Goren 2001). The jars were found standing upright in the storeroom, their bases embedded in the sand and they were stoppered with loess mixed with straw. Wine sediment was identified in the base of the jars. These vessels were apparently intended for export. Petrographic analyses show that the jars were produced in pottery workshops located in the vicinity of Mefalsim. In addition to the dozens of jars revealed in the storeroom, seventeen bronze coins were found ranging in date from 518 to 601 CE (Sokolov 2001), a date that is consistent with the ceramic finds from the late Byzantine period exposed at Tel ʽIrit, and it therefore seems that some of the Gaza Ware jars produced at Tel ʽIrit were designated for export. Tel ʽIrit was part of an extensive manufacturing and export system that operated in the sixth and early seventh centuries CE on the southern coastal plain. Based on the finds in the excavation, it seems that alongside the industrial production of jars and other pottery vessels, toys were also manufactured in the pottery workshop near Tel ʽIrit. Toys in the shape of animals with ceramic, bone and wooden wheels, which could be pulled, were common in the Byzantine period (Rahmani 1981; Porath and Levi 1993). Apparently, one of the hallmarks of the toys produced in this pottery workshop is the use of a decoration consisting of stamped circles. Stamped decorations are also common on serving vessels from the Mefalsim area (Rahmani 1983). Baumgarten Y. 2000. Evidence of a Pottery Workshop of the Byzantine Period at the Foot of Tel Ashdod (‘Ad Halom Site). ‘Atiqot 39: 69*–74* (Hebrew; English summary, p. 201). Baumgarten Y. 2001. A Pottery Kiln near the Giv‘ati Junction. ‘Atiqot 42:43*–50* (Hebrew; English summary, pp. 323–324). Eisenberg-Degen D. 2016. Es-Sawafir el-Gharbiya. HA-ESI 128. Fabian P. and Goren Y. 2001. A Byzantine Warehouse and Anchorage South of Ashqelon. ‘Atiqot 42:211–216. Feder O. and Erickson-Gini T. 2012. Ashqelon, Shimshon Neighborhood. HA-ESI 124. Gadot Y. and Tepper Y. 2003. A Late Byzantine Pottery Workshop at Khirbet Baraqa. Tel Aviv 30(1):130–162. Hadad E. 2009. Roman Byzantine Amphorae from a Terrestrial Site and its Underwater Environs: Horbat Castra and Kfar Samir (Southern Levant) as a Case Study. Levant 41(1):79–91. Israel Y. 1995. Survey of Pottery Workshops, Nahal Lakhish–Nahal Besor. ESI 13:106–107. Israel Y. and Erickson-Gini T. 2013. Remains from the Hellenistic through the Byzantine Periods at the ‘Third Mile Estate’, Ashqelon. ʽAtiqot 74:167–222. Majcherek G. 1995. 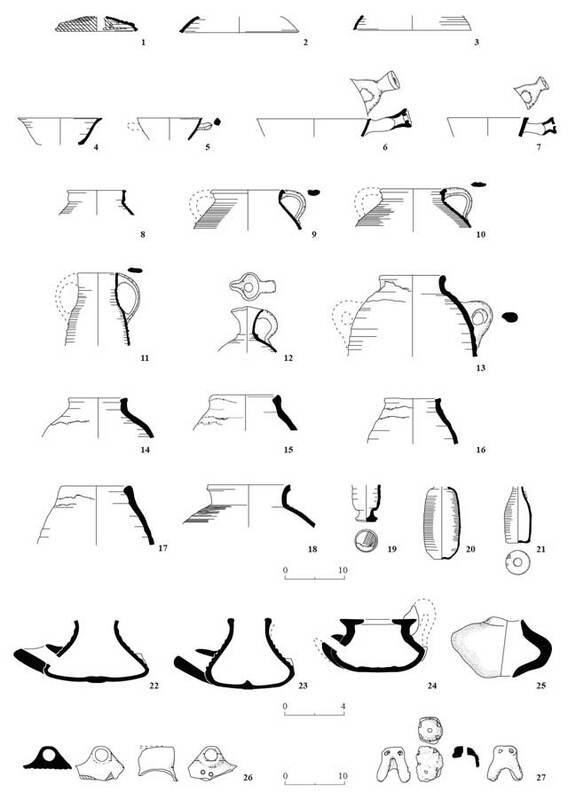 Gazan Amphorae: Typology Reconsidered. In H. Meyza and J. Młynarczyk eds. Hellenistic and Roman Pottery in the Eastern Mediterranean—Advances in Scientific Studies (Acts of the II Nieborów Pottery Workshop). Warsaw. Pp. 163–178. McCormick M. 2001. Origins of the European Economy: Communications and Commerce AD 300–900. Cambridge. Nahshoni P. 2007. Remains from the Roman and Byzantine Periods at Horbat Hazaz, Ashqelon. ‘Atiqot 56:81–97 (Hebrew; English summary, pp. 78*–81*). Opris I.C. and Rațiu A. 2016. An Early Byzantine Amphorae Deposit from Capidava. Journal of Ancient History and Archaeology 3(1):24–42. Peretz I. 2008. Khirbat el-Hannuna. HA-ESI 120. Porath, Y., and Levy Y. 1993. Mughar El-Sharaf: A Cemetery of the Roman and Byzantine Periods in the Sharon. ‘Atiqot 22:29*–42* (Hebrew; English summary, pp. 153–154). Rahmani L.Y. 1981. Finds from a Sixth to Seventh Centuries Site near Gaza: I. The Toys. IEJ 31:72–80. Rahmani L.Y. 1983. Finds from a Sixth to Seventh Centuries Site near Gaza: II. Pottery and Stone Objects. IEJ 33:219–230. Segal O. 2011. Tel Yavne. HA-ESI 123. Seriy G. 2010. Nir‘am Junction. HA-ESI 122. Seriy G. 2015. Children and Childhood in the Material Culture of North-Western Negev Sites in the Byzantine Period. M.A. thesis. Ben-Gurion University of the Negev. Be’er Shevaʽ (Hebrew). Sokolov H. 2001. The Numismatic Assemblage.In P. Fabian P. and Y. Goren. A Byzantine Warehouse and Anchorage South of Ashqelon. ‘Atiqot 42:216–218. Tomber R. and Williams D.F. 1986. Late Roman Amphorae in Britain. Journal of Roman Pottery Studies 1:42–54. 2. The excavation square, looking north. 3. The section documented in the excavation. 4. Strata of soil and potsherds in the section, looking north. 7. Cooking utensils, storage vessels, lamps and special finds.